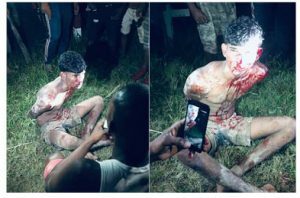 This man was badly beaten by residents of Parika, East Bank Demerara after he and others allegedly went to steal gas from a resident in the area Friday evening. The injured man was transported to the hospital where he was treated and discharged. He, along with another suspect, who was caught yesterday are in custody assisting with investigations. In a post on social media, an individual described the suspects as “heartless people” adding that they are the ones who break into homes and rob and kill. The individual also alerted residents to be vigilant since there are thieves in the village.